September | 2010 | Quilting my way through life! My favorite of favorite TV shows is, hands down, Antiques Roadshow. I love watching to see if someone’s treasure is actually worth something, or if it only has personal value. I have fun guessing out loud what the item could be worth and when I guess it right, my family swears I’ve seen that particular episode before. OK, I’ve probably watched too many episodes when I can guess exactly how much something is worth, but really they’re just guesses. And usually the appraisers kind of give it away. Well, it’s one thing when Great Aunt Gert’s antique turns out to be valuable, it’s not like they’re going to sell it anyway. BUT being the junker that I am, I’m a lot more excited when that $2-$10 garage/estate sale item turns out to be worth thousands or even better, tens of thousands of dollars. 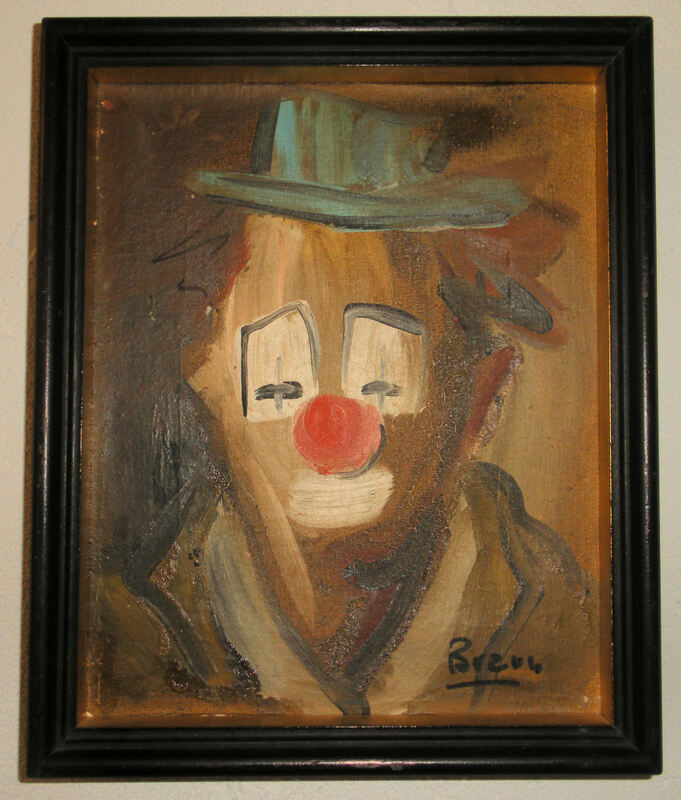 That’s why last week when I helped our church sort donations for a rummage sale, and noticed the painting of a clown set amongst other priceless treasures, I decided I needed it. I first of all couldn’t believe another sorter of said treasures didn’t choose to take it home themselves instead of putting it with other like treasures, or better yet, someone else gave it away!!! I’m sorry to admit that I know nothing about paintings. The only thing I knew is that this was an original work of art. The paint is a bit crackled, but if I put $1,000 into it for restoration, that could increase the value upwards of another $10,000. I couldn’t read the signature. Can You? Then, when I turned it over, thankfully there was a plate, and that I could read, sort of! 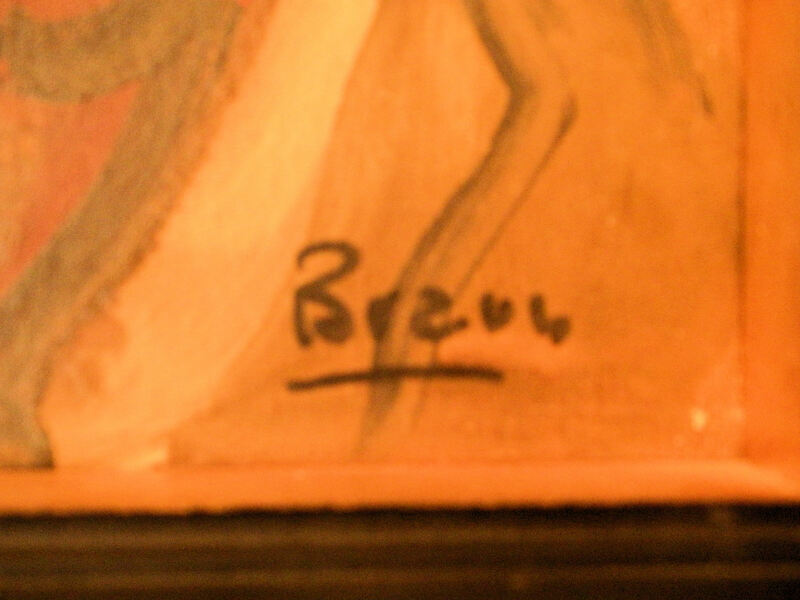 It says the painter’s name is Braun, I think, it’s a bit worn. 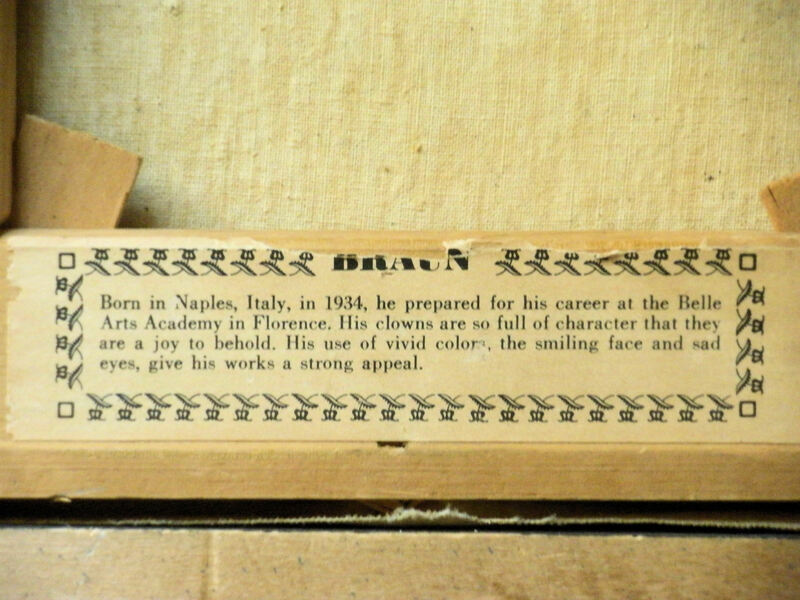 He was born in Italy, 1934. I tried to find out something about him online, but found nothing. I would assume he is still living. Perhaps when I have more time, and drive, I will try again to find out more about this artist. For now, I’m content with the idea that this is as close as I will come to owning a Rembrandt, Van Gogh, or any other valuable painting. That’s OK with me. He’s a cute little clown. The true value is really what it means to the owner, right? New Pattern, Sun Drenched 9 Patches! That’s right, now that school’s back in session, I’ve been back to my designing and sewing! 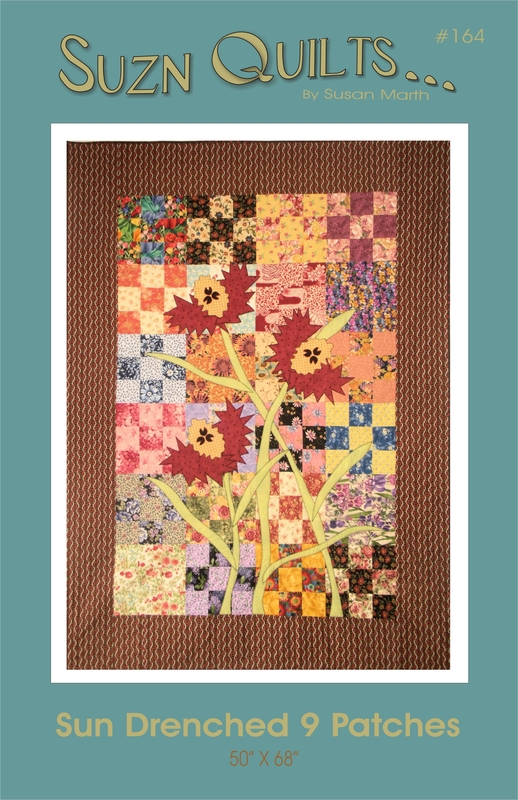 This project actually started several months back as a block swap with my guild, Heartland Quilt Guild. I am the night meeting projects coordinator. I had a request for a 9 patch swap, so the requirements were to sew as many or as few 9″ (finished) blocks with two contrasting floral fabrics as you wanted. I gave instructions to make 24 blocks using two, one yard cuts of fabric. We had one member make as many as 100 blocks! She made more than one quilt with those. 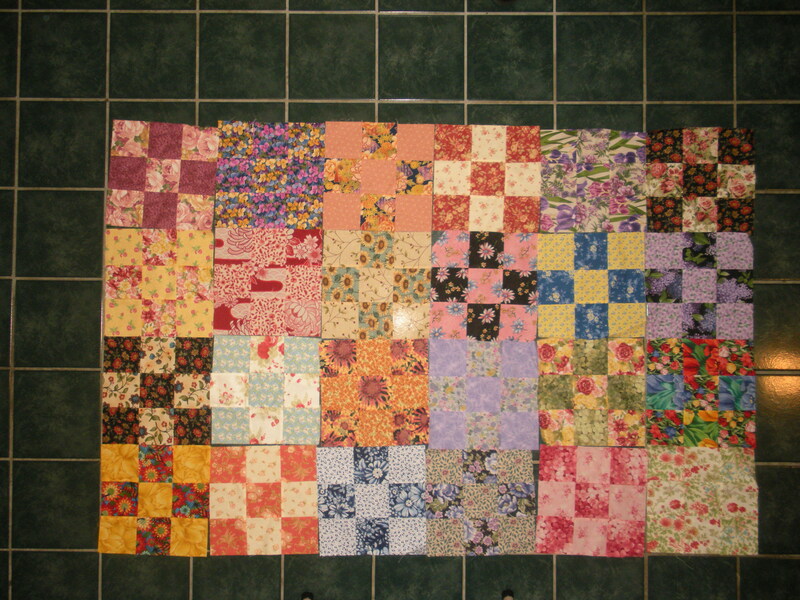 I made 24 blocks myself, all using the same two fabrics. We had the swap and then I had 24 different blocks. I then organized a challenge. 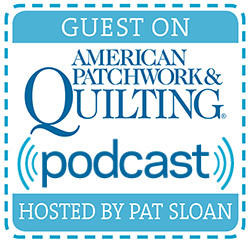 The only requirements for the challenge were to use the blocks from the swap and put them into a finished quilt. I was originally going to slice up my 9 patches and sew them back together, but when I laid the blocks all out, I fell in love with the watercolor type effect that they made. I decided then to applique on top of the blocks instead. I added a busy border fabric that I thought worked great in keeping with the busy-ness of the floral blocks. Next came time to decide what to applique on those blocks! That was literally the hardest part of this design. I knew a large-scale flower was needed, and it had to have a nice contrast with all of the florals in the 9 patch blocks. So here’s my finished quilt & pattern! It reminds me of a bright sunny day! Measuring 50″ X 68″ it will make a lovely wall or lap quilt. You can purchase this new pattern on my website! I used quick, fusible web applique. I also layered the top with the backing & batting and let my applique stitch be part of the quilting. I then added more free-motion quilting to fill in. You can make the 24 blocks yourself, or organize your own block swap! Now that all the kids are back in school, full swing, I’m finally getting back to my sewing machine and actually designing new projects too. 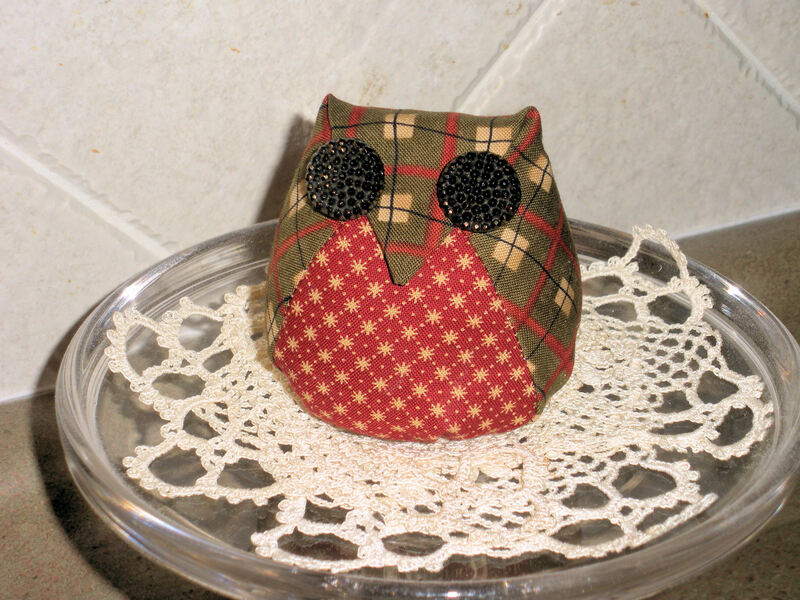 However, I had a bit of a detour after seeing this cute little project on a blog last week. I had to stop what I was doing, grab a couple of pieces of fabric and start sewing. 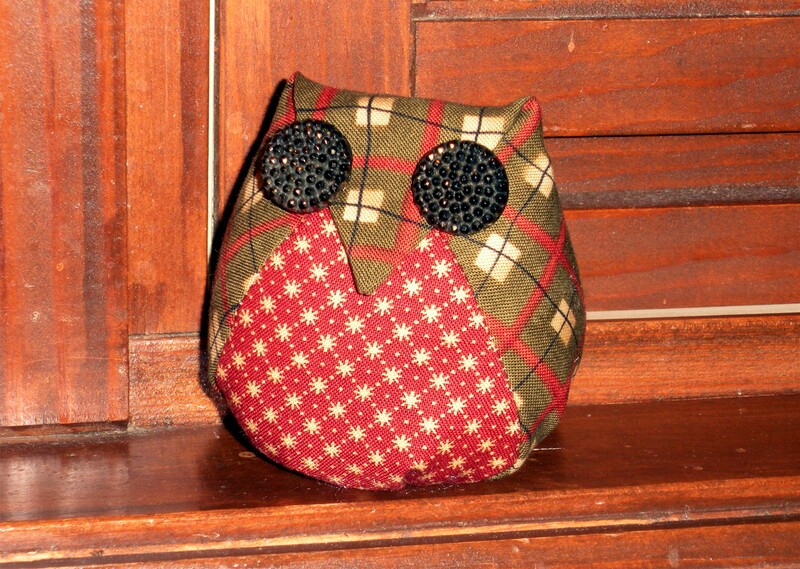 OK, it took longer to remember how to enlarge the pattern 200% than it did to make the entire owl, I’m just sayin’! Isn’t he cute? It’s just two triangles of fabric, two buttons for eyes and a bit of polyfil. Please note the original pattern finishes the size of a golf ball, so I enlarged the pattern 200% to make him about 3″ tall. You could make one for each of your friends without a lot of time invested. He looks cute sitting on my kitchen counter!